Molecor is a company that offers full business support to its customers, providing them the latest technology transfer, together with the specialized product knowledge for the promotion of PVC Oriented pipes. It has recently participated in several events in conjunction with Floking Pipes, first Indian PVC-O pipe manufacturer, which works with the innovative Molecor technology. 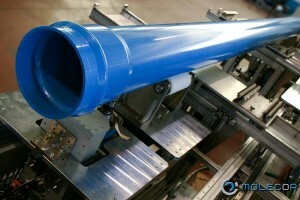 In Plastindia 2012 Molecor has introduced Floking Pipes as the first manufacturer of PVC-O pipes in India. The exhibition, dedicated to promoting business opportunities in India for the plastics industry, has taken place in New Delhi from 1 to 6 February. Another important event for Floking Pipes has been the Water Expo 2012 in Chennai, event focused on of the local water industry, conducted between 7 and 9 February, a meeting point for several water companies, municipalities and contractors to learn about developments in the sector. Pipes Floking and Molecor were there as exhibitors. Mrs. Dolores Herran, Molecor Tech Sales Manager, presented a conference entitled: “the innovative technology of molecular orientation applied to PVC-O pipes (en este caso no hablamos de TOM, que es SOLO nuestros tubos fabricados en Mejorada, lo que queremos vender aqui es el PVC-O), the next step in the evolution of plastic pipes”. Plastics sector in India is one of the most profitable industries, and holds a highlight position in the Asian economy development. Plastic demand in India will triplicate over the next decade. Molecor continuous support to Floking Pipes is crucial to promote PVC-O pipes in this market.